Michael Sabo is a research assistant for the B. Kenneth Simon Center for Principles and Politics at The Heritage Foundation. As Thanksgiving Day approaches, Americans are preparing to give thanks for what Abraham Lincoln called “the blessings of fruitful fields and healthful skies.” In keeping up this tradition, Americans are hearkening back to the example set by the pilgrims and the members of the Wampanoag tribe almost 400 years ago. For example, early in the film, the pilgrims take corn from what to them looks like a deserted village. Later, Aspinet and his tribe attack them for stealing their food. But it is not obvious that the pilgrims committed a wrongful act. A system of law respecting property rights had not yet been established. And there is no doubt the pilgrims needed food to sustain themselves. Of the 102 Pilgrims who crossed the Atlantic, only 59 survived to see the first Thanksgiving. Thankfully, the director allows the audience to think through these complexities without forcing a simple conclusion. 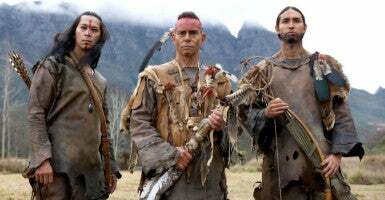 Neither does “Saints and Strangers” portray the Indian tribes in one-dimensional fashion. In one instance, at a meeting of the surrounding tribes, Canonicus, the leader of the Narragansett, proposes a plan. For protection against the English, he asks each tribe for tribute. Massasoit, who heads the Wampanoag, decides not to join this venture. These are just a couple of the examples in the film that help break us from the pseudo-morality of pure good vs. pure evil that is increasingly popular today. Disclaimer: This reviewer was able to watch only the first part of the film, which ends in mid-summer 1621.